Feeling a little ... melodramatic? I know I usually do by the time Thursday rolls around, though perhaps "deliriously silly" is a better way to put it. Whatever you're feeling, Instagram has a new way for you to express yourself on its service with a camera effect called Superzoom. Superzoom records a clip of you (or whatever you're pointing your camera at), and automatically zooms in closer in comedic fashion. There's also bombastic music to complete the effect. To use Superzoom, first open the camera inside the Instagram app. You'll then see Superzoom located next to the Boomerang button. Either tap this button once to record a three-second clip, or hold down to record a longer one. Once you've gotten up close and personal, you can share your Superzoom or add it to your Instagram Story. 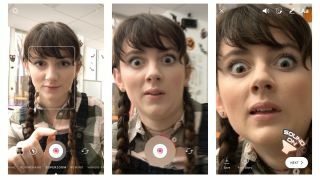 Also, just in time for Halloween, Instagram has added five spooky face filters and new stickers to get you in the spirit. The filters include a zombie, a vampire that transforms into a bat, and a sinister fog, while the stickers range from candy corn to dismembered zombie hands. These haunted filters and stickers will be available through November 1. Trivial as these additions may seem, this is yet another move by Facebook-owned Instagram against rival Snapchat. Whatever Snapchat does, Instagram is able to do soon after, and often times, more successfully. We'll see if users flock to Superzoom, but it's almost certainly in for a lot of play as users try to one-up their friends with the most over-the-top video.